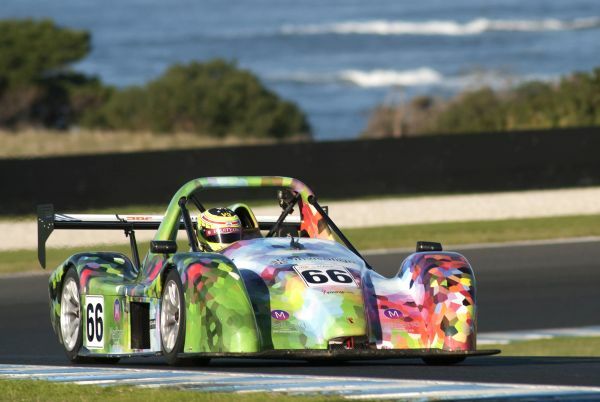 Against the odds, recovering Radical Australia driver coach James Winslow and team-mate Yasser Shahin, have claimed back-to-back victories at Phillip Island during the fourth event of the 2018 season, the popular duo overcoming a huge race two pitstop compensation penalty to claim the round win from mother and son combination Sue Hughes and Jon Collins, and runaway championship points leader Kim Burke. 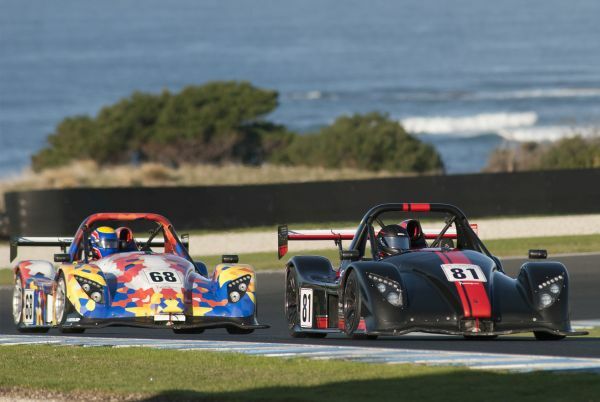 Traditionally Phillip Island mid-year can throw up all weather conditions, but whilst every day dawned cold signaling the arrival of another southern winter, conditions through the day couldn’t have been more perfect, although despite ideal ambient temperatures, no-one in the end could touch Michael Shaw’s 2014 Radical SR3 lap record of 1:30.7320, the teams struggling to get their control Dunlop tyres to optimal working temperature in the cool air. Winslow set the pace in opening practice, the Englishman showing no outward signs of his 2017 LMP3 crash in the Middle East that saw him bed-ridden for some months afterwards, his 1:32.1473 in the morning’s first session ultimately the quickest of the day as he shared driving duties in the #66 he would drive with Shahin, and the #68 of points leader Kim Burke. Perhaps the most impressive drive on the day though was former F3 and new LMP3 driver Nathan Kumar, the New South Welshman drafted in by Winslow for the weekend, and like Shahin and Burke, he was taking valuable pointers from the former Le Mans star. Making it three former F3 regulars in the top three by the close of practice was Jon Collins, the 2015 Australian Driver’s champion third fastest, having helped mother Sue to an improvement in her performance due to a last-minute seating change to accommodate the taller Collins. Mitchell Neilson was beaming like a Cheshire Cat after his first laps of Phillip Island, the South Australian round winner and reigning RAC rookie-of-the-year (both alongside father Brad) getting quicker with each run despite a niggling electrical challenge which saw the car crawl back to the pits after picking up an engine warning signal. Whilst Winslow would top the timesheets in the early morning session with a new SR3 qualifying lap record of 1:31.1530, alongside Yasser Shahin, the pair would ultimately start third behind title rivals Kim Burke (1:31.9274) and Chris Perini (1:32.0959) on combined times. Sadly for Nathan Kumar, a stunning 1:31.5606 - also under the standing qualifying lap record - would ultimately be negated after the rookie was found to be mere grams underweight post-session, forcing a disappointing rear-of-field start. For Saturday afternoon’s opening race all eyes were on the title fight between the two front-row starters, although it was the fast-starting Yasser Shahin who got away best to lead down to turn four the first time around. Much further back Nathan Kumar started his long journey forward, the RAC rookie more than 20-seconds down on the field at the close of lap one after starting from pit lane, but he’d very quickly find himself further forward by the close of the compulsory pit stops. With Shahin opening a gap over the field ahead of his stop, behind him Kim Burke held title rival Chris Perini at bay, although both very quickly came under fire from a charging Mitch Neilson who ultimately worked his way past to be second by lap 11, before he ultimately hit pit lane for his stop eight laps later as race leader. Brad Neilson emerged from pit lane with the lead intact, but with a hard charging James Winslow pumping out a sequence of laps in the low 31s to haul in the #38 machine which was still suffering an intermittent electrical issue. That issue ultimately lost the Neilson’s 30 seconds over the final lap alone, dropping them to rear of field before the flag. In the end, no one could stop the charging Winslow, the Englishman taking he and team-mate Shahin to the win by almost 20 seconds over a fast-finishing Jon Collins, with reigning NSW SuperSports champion Rowan Ross a well deserved third. Sadly for Nathan Kumar, a record 31-laps in the books saw the rookie weigh in again just grams underweight in post race scrutineering, dropping him from the results after crossing the line a brilliant second to Winslow, the additional fuel burn across the final laps bringing him just under the minimum mark. Kim Burke was a content but disappointed fourth having conceded 25-seconds to title rival Perini during the compulsory pit stop, although despite the setback, he’d actually extended his championship points lead over his rival. Peter Clare was an ecstatic fifth after setting a sequence of personal bests across the day, the ‘Shared Runway’ driver lamenting a complete turnaround on his 2017 performance which was blighted by contact with the barriers at Southern Loop in qualifying, his lap times this year often faster than anyone else on track! Sadly for Chris Perini, his opening race ended after contact with Clare at Southern Loop upset the balance of the car, whilst a stalled engine on the entry to pit-lane behind Nathan Kumar (who almost came to a complete stop ahead of Perini as he hit the control line) dropped him 15-seconds as he fought to refire the car and complete his stop. For Sunday’s second race, James Winslow lamented pre-race that he and Yasser Shahin would be in damage control mode, their 125-second compulsory stop (by virtue of Winslow’s driver grading and their race one success) would require a miracle should they manage to make the podium for the second 50-minute journey around the Island - but as they say, you can always believe in miracles..! Winslow was outstanding off the line, charging from the second row to split Burke and Perini on the run down to Southern Loop to open out a three second lead on the first rotation before ultimately pitting with the lead out to almost 20-seconds. His pit-stop timing was impeccable and a lap earlier than originally scheduled, but just as he pulled down pit entry, the field came under the control of the Safety Car to recover the stricken #88 entry of Rowan Ross who had gone into the tyre barriers on the outside of turn two. Ross appeared to have clipped the inside kerb on the run into Southern Loop, forcing him wide and off-line on the exit and into the gravel trap at speed. He managed to wash off some of his pace before contact with the tyre barriers, but was able to extract himself from the car and walk back to the medical vehicle with officials. Shaken but no stirred, the RAC veteran was an immediate retirement, but officials gave the field a handful more laps to allow the race to be declared, with time also allocated to repair the fence ahead of the next race. Sadly for Jon Collins, who had worked his way into second and ultimately the lead as Winslow hit pit lane, he hadn’t effected his stop before the Safety Car intervention, so was forced down pit lane the first lap after the Safety Car pulled in, ultimately losing his advantage and track position to everyone else in the field. As a result of their timely pit stop, Winslow and Shahin not only negated their 45-second pit stop compensation penalty, but they also gained a lap on the field as all but Collins had hit pit lane ahead of them. That message was relayed to Shahin who on the restart had pounced on the pack ahead of him, to ultimately start putting them a lap down, but in the end, he backed off to ensure the team’s comfortable victory, with Nathan Kumar finally making good on the promise he’d shown since opening practice, to claim second. Chris Perini too was rewarded for his renowned 2018 pace with third, whilst a smiling Kim Burke was “satisified” with fourth, and a minor extension in his points lead heading back to Sydney Motorsport Park in September. Peter Clare was all smiles with his career best weekend, claiming fifth for the second race, ahead of Mitch and Brad Neilson who likewise couldn’t wipe the smiles from their faces after what had been an outstanding weekend on their debut at Phillip Island. For the Radical Australia Cup teams, the next round sees a return ‘home’ to Sydney Motorsport Park on 21-23 September, the home-base of Radical Australia, at a circuit that much of the field knows intimately, with a strong local field expected to add to the RAC regulars as they all look to make an impact on Kim Burke’s almost insurmountable championship points lead.